Boarding the Galaxea at the Republic of Singapore Yacht Club, we made our way to St John’s Island to pick up the TMSI folks and the dredge equipment. Complementing last year’s Northern Expedition, this year the Mega Marine Survey is concentrating its efforts on Singapore’s Southern Islands. The Southern Islands’ seabed has been divided into grids for the purposes of tracking the specimens retrieved at each section and today’s first stop was the waters between Kusu and Lazarus islands. 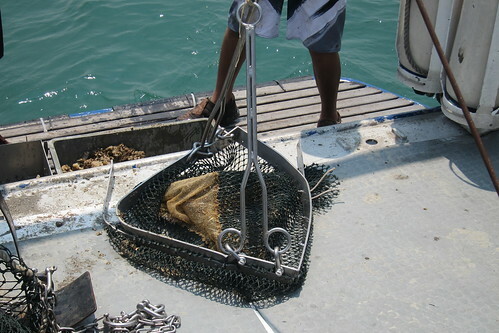 When our first haul came up, the most immediate observation was this grid has quite an abundance of barrel sponges. Perched on stools the three of us then poked around the sediment picking out feather stars, crabs, sea stars of varying sizes and other creatures. These were then quickly packed away in plastic containers and Ziploc bags before being stored in the cooler box. 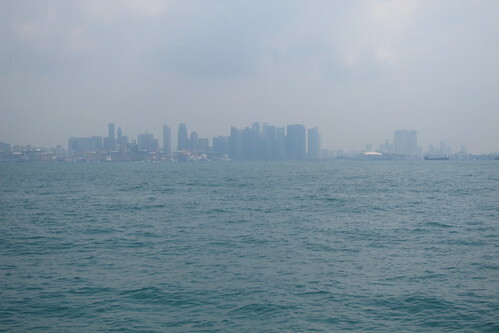 On the way to our second site, we could see Singapore’s central business district skyline in the hazy horizon. It was surreal to think that just across this small body of water, lay a world completely different from which we were in at that moment. Our next two dredges, although in nearby sites brought up vastly different substrates. 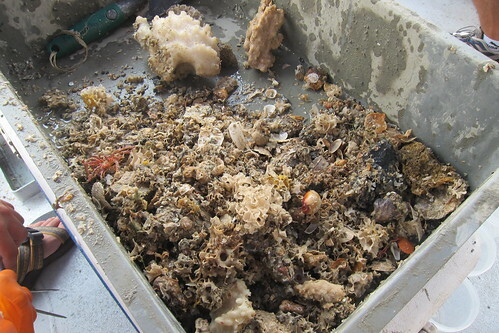 The second was so muddy when it came up that it had to be rinsed with seawater before we could begin sorting. 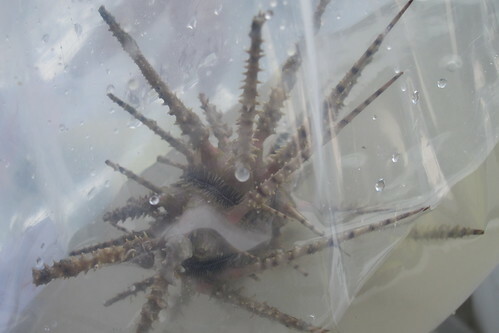 It also yielded less creatures than the first dredge but brought us an unusual urchin that had thorny-looking spines. Though we had planned to do at least four dredges today, our efforts were halted after the third as the frame of the rectangular dredge broke – and just when we were getting into the hang of things! But such is the nature of field work. Sometimes unforeseen things happen and this all goes to show how challenging this work really is. 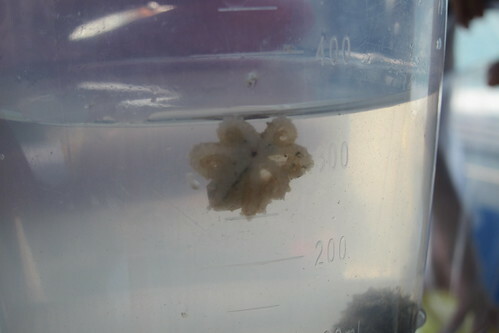 But we still found this baby octopus which was scurrying to hide among the sponges and pebbles. While the day may have ended prematurely, this proved to be a fascinating way to spend a morning uncovering the little gems in our waters. Even from Pulau Hantu to Kusu Island alone, we have witnessed for ourselves the wealth of diversity that Singapore holds in her waters! You’re welcome Carlo! 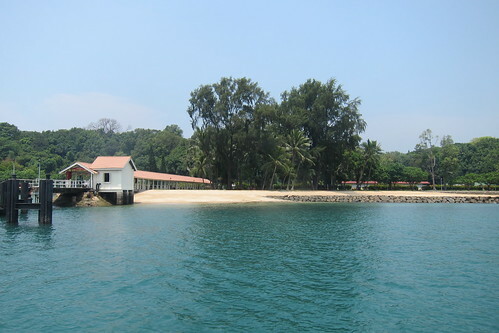 Do join us for a dive if you’re visiting Singapore! Out of curiosity, are the creatures returned alive to the sea after data taking? Thanks for your question Wenpin! This is a question that is often asked by participants. What happens to specimens after collection? More details in this post.